Following the success of our Perfect Paella Kit – we have looked again to Spain for inspiration and conjured up the 'Tantalising Tapas Kit'. The great culture of Spain has always been famous for its cuisine and where better to start than with a glass of Sherry & Tapas? Our Tapas Set is bursting with the tastiest tapas from all of the Spanish regions. Including some of Spain’s most well-known Tapas favourites (including Chorizo, Habas Fritas and Sherry - you can see a full list below) any foodie would be chuffed to receive such a box of Spanish excellence and be transported through the flavours to Spain's ancient cities and medieval towns. Excellent selection of goods, well presented. 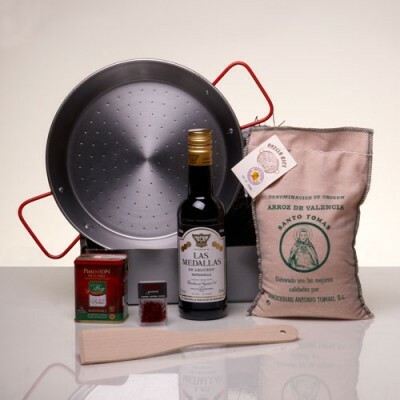 This Tantalising Tapas kit is for my 'hard to buy for' son and I think he'll be thrilled. It's beautifully packed and the contents look to be of excellent quality. I will certainly recommend you to to everyone. Not eaten the contents, but all looked wonderful. Good kit and the receiver of present loved it however I thought the actual box containing the kit could have looked smarter and a slightly more befitting of it's contents. I know packaging costs and postage have to be controlled but a slightly more appealing box would have made the product a better gift. Great gift but unfortunately the alioli was awful! !